There is not a better setting to go sailing than on the serene waters of Bahia de Banderas (Banderas Bay). This massive body of water on the Pacific Ocean possesses five hundred square miles of surface area. The vacation paradise of Puerto Vallarta sits on the shores of this expansive bay. With verdant rolling hills of the Sierra Madre Mountains bordering this beautiful bay, you will witness views beyond compare on your sailing excursion from Marina Vallarta. 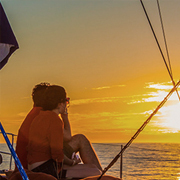 Whether you are an experienced sailor or a sailing novice, we have the Banderas Bay sailing excursion for you. Our veteran crewmembers enjoy introducing beginning sailors to their favorite sport. Sailing is an ecologically-safe, fun, and relaxing activity that can be enjoyed by participants of all ages. 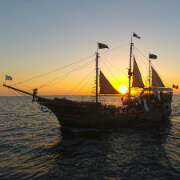 We offer a wide variety of sailing charters on vessels of different sizes. 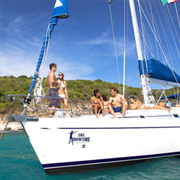 A private sailing charter is an excellent option for families or large parties to enjoy a private day on the water. You can plan your own itinerary on a private expedition on one of our sleek luxury sailboats. Banderas Bay is home to plenty of secluded coves, splendid islands, and a dazzling array of wildlife. 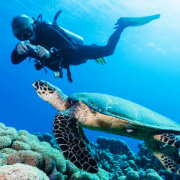 Our sailing tours can include journeys to destinations in the bay like the Marietas Islands, Los Arcos, and Las Caletas, where passengers can participate in ample activities like scuba diving, snorkeling and sea kayaking. Banderas Bay is home to plentiful diving sites with teeming coral reefs and unusual geological formations. During the wintertime, you can enjoy a whale watching excursion to witness humpback whales surfacing in the shimmering waters of Banderas Bay and the Pacific Ocean. Sail with the charming crew of our 54-foot sailboat, the Tinuviel, to visit the quaint bayside fishing hamlet of Yelapa. This peaceful coastal town can only be reached by water. This pleasant coastal oasis offers visitors fantastic snorkeling and jungle trail hiking to a picturesque waterfall cascade.